This simple science experiment is perfect for kindergarten kids who are just learning about chemical reactions. The baking soda and vinegar reaction is totally kid-safe, and easy to do in a group setting or with just one child. 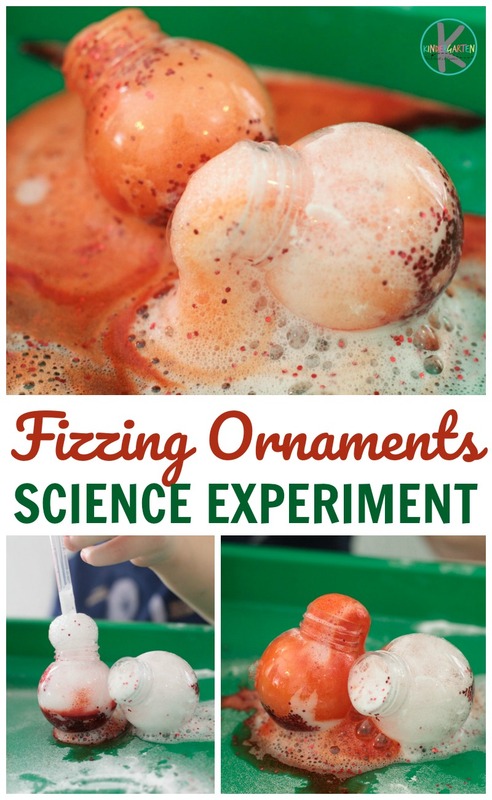 This Ornaments Science Experiment is perfect for a Christmas Activity. Ornaments Science Experiment is such a fun Christmas activity that will delight and teach at the same time. 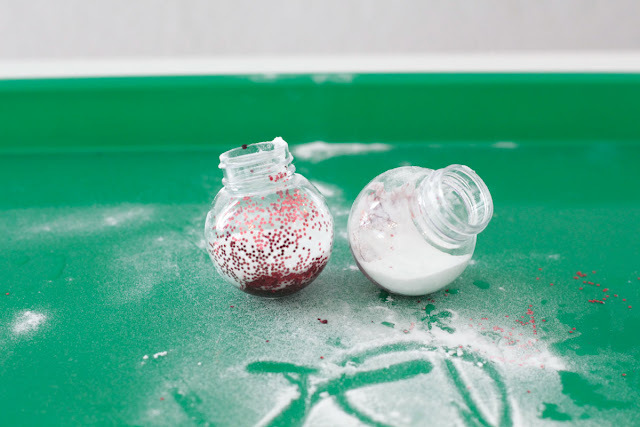 Use small plastic ornaments and glitter to give this classic science experiment a Christmas twist! Kids will love repeating this experiment over and over again. Fill each ornament 1/3 of the way full with baking soda. Add a few drops of food coloring and a squirt of dish soap. Sprinkle the inside of each ornament with glitter. Place the ornaments on the play tray and you are ready to watch your Ornaments Science Experiment FIZZ! Give your child a small dish filled with vinegar. 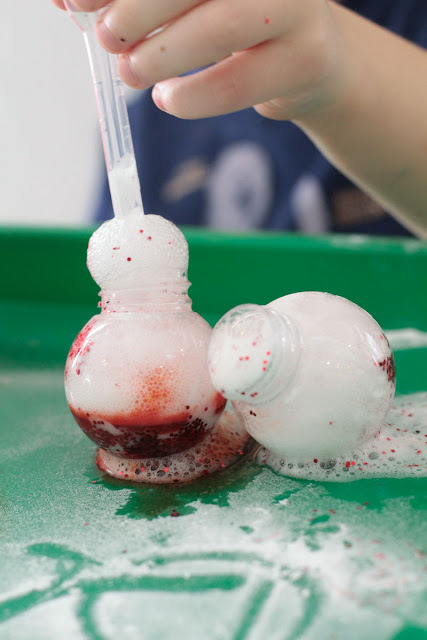 Show them how to use the pipette to squeeze up some vinegar and pour it into the ornaments. The ornaments will start to fizz and overflow. At first, the mixture will be white, but once the reaction hits the food coloring, it will turn whatever color you dyed it. Young kids will find that particularly thrilling. The Science behind this Ornaments Science Experiment is that the baking soda is a base and the vinegar is an acid. When the two materials mix, they create a chemical reaction that gives off carbon dioxide. 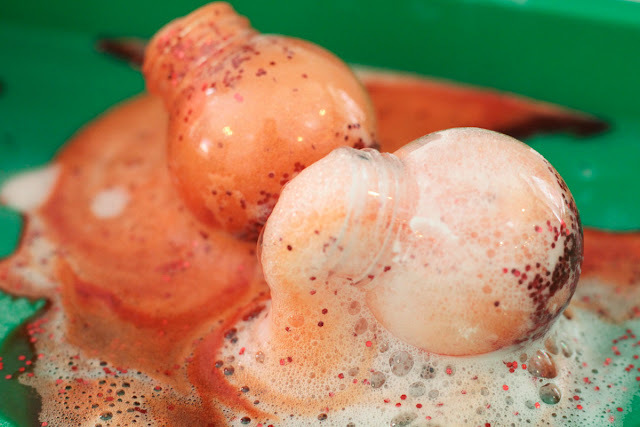 This gas rises into the air, taking some food coloring and bubbles with it, making a pretty, glittery fizz that is completely safe for kids to touch. Make sure you see all our Kindergarten Science Activities!